Esker’s Purchasing solution optimizes spend requests and goods/services ordering by eliminating paper and manual processing steps. Businesses save time and money with online purchase requisition and order forms, as well as benefit from company compliant and standardized approval workflow. Together, with Esker's Accounts Payable solution, you can automate the entire purchase-to-pay process! 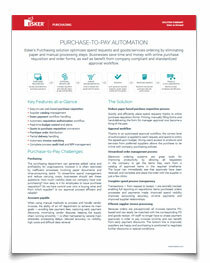 Download the Purchase-to-Pay Automation solution summary to learn more! What process can we help you improve today?